Witness to a Limited Intervention? So, what were those who pilot the UFOs doing during the October 1962 Cuban Missile Crisis? Given other, now-documented clusters of UFO activity at nuclear weapons laboratories and storage areas, or during periods of intense atomic testing in Nevada and the Pacific—or, later on, at U.S. Air Force ICBM sites outside various Strategic Air Command bases—one might predict that a UFO presence would be in evidence, in one form or another, during the planet’s closest brush with nuclear catastrophe. The first hint I had of possible UFO activity during the missile crisis arrived, quite unexpectedly, in 2006, when I was provided with an intriguing report first sent to the Center for UFO Studies (CUFOS). The source, retired U.S. Air Force Technical Sergeant Christopher N. Smith, had been a jet engine mechanic with the 42nd Field Maintenance Squadron (FMS) at Loring AFB, Maine. In his letter to CUFOS, Smith offered an utterly amazing, almost unbelievable account of a dramatic UFO incursion on some date in, he thought, 1961. After I read his report, I called Smith, spoke with him at length, and concluded that he was a reliable witness—despite the fact that one element in his story pressed the limits of credibility. In any case, when I began researching the particulars of Smith’s report, including the type of position he held in the Air Force at the time of the incident, it soon became clear that the UFO sighting had actually occurred in the fall of 1962. 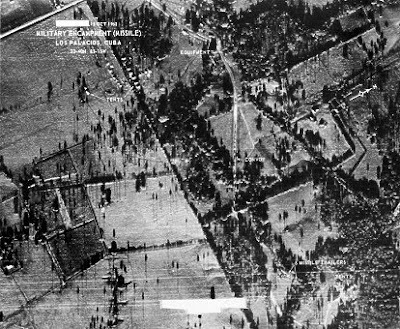 More to the point, based on other information I later received—relating to a unique, temporary departure from the type of B-52 missions then being flown at Loring—it seemed certain that the UFO sighting reported by Smith had to have occurred during the period of the Cuban Missile Crisis or immediately thereafter! Smith had mentioned in his original letter that a two-aircraft mission, designated “Chrome Dome”, had been on final approach for an emergency landing just as the UFO appeared over the base’s flight line. I soon learned that whenever the 42nd Bomb Wing at Loring had the responsibility for launching Chrome Dome missions (it rotated among several SAC bomber bases) two sorties-per-day were flown, each involving a single B-52 flying one of two courses, known as the Northern and Southern Routes. However, during the heightened-alert period of the missile crisis—and apparently at no other time—two aircraft flew each course. This temporary operational change is confirmed in the 42nd Bomb Wing’s unit history. Moreover, a retired colonel who flew such missions at Loring during that era later told me that the tandem Chrome Dome missions had been discontinued in, as he recalled, early November 1962, once the crisis had passed. Consequently, if a two-aircraft Chrome Dome mission was in fact returning to base at the time of the alleged UFO sighting, as Smith contends, the incident he reports had to have occurred on some date during, or a few days after, the two-week-long Cuban Missile Crisis. As the two bombers were half way through their third go around, there it was. I saw the captain and several other men pointing up over our immediate area. There was a monstrous-sized aircraft. It was a dull metallic gray, cigar shaped; it was descending to a lower altitude and when it stopped moving and hovered, it stretched half way across the length of the aircraft ramp area, making it about a half-mile in length in my best estimate. I didn’t feel any fear at all; I remember not really feeling anything except wonderment. I also immediately knew why the bombers were aborting, at least in my mind I knew. It seemed reasonable to imagine, the two bombers were intercepted by this huge UFO, [and] because of its enormous size and possible malfunctions [it caused in] the B-52s electronic and electrical systems, the flight crews would have immediately reported the sighting and any problems with their electronics to the [Strategic Air Command] Command Post at Offutt AFB. Under those circumstances, they would have very likely been told to abort the mission and return to base. Out of the corner of my eye I saw the first 52 landing, the drag chute popped and minutes or so after, the second bomber also landed. At this time, the UFO began to move, slowly for a few seconds and then very fast. It silently zoomed up and away towards the east and in seconds it just disappeared. No one spoke; in fact I don’t recall anyone talking during the entire time of the incident. After it disappeared, I said to the captain, ‘Did you see that! ?’ He almost glared at me and tersely replied, ‘No, I did not see it!’ He didn’t ask, ‘See what?’ or ‘What are you talking about?’ He said ‘It.’ He saw it, we both saw it, hell, one could not miss seeing it. The captain strode off towards the parked staff cars and never ever spoke to me again. After the bombers taxied in and parked, the flight crews deplaned and in a seemingly nonchalant manner conversed with the dozens of commanders who had arrived. No effort was made to [launch] an alert aircraft [to replace the aborted bombers] and in a few minutes the crews were bused off to debriefing and everyone else except the crew chiefs and some of the air police departed that portion of the flight line. On our way to the engine shop nobody talked, it was strange, but at the time I do not recall thinking about it being so. Bob ----- and I and the other two engine men from the second van put our tools in the tool rack and went upstairs to the coffee shop. No one spoke of the UFO then or later. Our branch chief and all of the shop chiefs were sitting there having coffee and they had all been out on the ramp and saw the same thing we had. No one, including Bob talked about the incident. In short, Smith reports that following the brief appearance of the unidentified craft above the flight line, which had departed at high velocity, he and the other witnesses standing nearby him all went about their business as if nothing had happened. Although Smith and the others had reportedly been staring skyward at the spectacle in obvious wonder, once the UFO departed there was absolutely no discussion of its presence among the witnesses—something that baffles Smith to this day. While one might be tempted to point to this highly improbable aspect of Smith’s account as evidence that the sighting was merely an imaginative fantasy, having no basis in reality, numerous other UFO sighting reports over the years also feature statements by credible persons regarding inexplicable behavior on their part during their own close encounter, whereby the emotion of fear had been mysteriously suppressed by some unknown mechanism, rendering them calm and compliant for its duration. Moreover, other illogical behavior has also been reported, including a post-encounter nonchalance totally inappropriate for the situation. In other words, although the scale of the event reported by Smith is rare—involving hundreds of UFO witnesses at Loring AFB acting in a zombie-like manner—the behaviors he reports are not unique to his case. As we got some food and drinks and started to watch the cartoons, I could just make out something approaching the screen from behind and above. A huge chevron came into view over top of it! I asked Mike if he could see it. ‘What the hell is that?’ was the reply. Its speed of advance was incredibly slow—my best guess is 10-15 mph—and it seemed to float rather than fly. It had no lights and blotted out the stars in the sky and was utterly silent. Mike and I got out of the car and stared at this thing. From wingtip-to-wingtip it was larger than the drive-in parking area—perhaps three football fields wide. It proceeded in a straight line right over top of the first row of cars. By now, I could see that almost everyone was out of their vehicles and pointing and looking around, quite possibly to make sure everyone else was seeing the same thing. As it continued on, all of the lights in the drive-in went out. The movie stopped and the concession stand went black. I noticed that several people were trying to start their cars and leave, but none of the cars would start. There wasn't any panic but I could tell that some of the folks were completely terrified. Mike and I weren't speaking by this time; we were staring at this thing as it continued on its way. By the time it made it right over top of us, I could feel that something wasn't quite right; I could see and actually feel that the air around us was shimmering, like you see above asphalt on a hot day. The air felt heavy and we both found that it was difficult to move; my ears popped even though it was completely silent around us. I could hear Mike but we could not hear anything else, any of the other people talking or yelling. The shimmering air had the effect of making one feel as if you were walking underwater—now known as the ‘Oz’ effect. I felt that if I could have reached down and picked up a piece of gravel, I could have thrown it and hit this object—that's how close it appeared. I was struck again by the complete and utter silence around us. Everyone seemed to be in a funk and just standing around looking at this thing. It never veered or changed direction and hovered over top of the park for what seemed like 10 minutes. I only took my eyes off of it a couple of times to get a quick look-see what other people were doing. It was traveling from the west and proceeding in an easterly direction. When it cleared the vacant property—a vast field of undeveloped real estate behind the drive-in—the Oz effect disappeared and it felt as if a weight had been lifted off of you. All of the lights flicked back on and the movie started again, like a switch had been flipped. I continued to watch this object until it disappeared from my view in the distance. It never changed course but ‘flew’ or floated in a straight line. It was incredible. Once I lost sight of it, I got back in my car, almost robotic-like, and completely forgot all about what I just witnessed. Mike and I did not speak to each other about it, ever, and we just carried-on watching the movie as if nothing happened. Apparently, so did everyone else in the park. No one—I mean nobody—was running around asking questions or doing anything but watching the movie. I recall having to go to the bathroom sometime afterwards and, as usual, there as a bit of a line to get in. But no one talked about it; no one said a word about what just happened. When the movie was over, we left. I dropped Mike off and went home, completely forgetting what just happened…I never told my brother or my parents. Some years later, I was in a bookstore and happened upon a paperback edition of [Project Blue Book Chief] Edward Ruppelt’s The Report On Unidentified Flying Objects and BANG! the experience flooded upon me as if a gate had been opened. I had to sit down and absorb it as I was almost overwhelmed by it. I had lost contact with Mike by then and was unable to verify it with him. So, again, retired jet engine mechanic Chris Smith’s bizarre experience at Loring AFB, in October 1962, was hardly unique. If any U.S. Air Force veteran reading this article identifies with his account and experienced something similar during the Cuban Missile Crisis—at Loring or any other Air Force Base—I would greatly appreciate hearing from you! Your information will be kept strictly confidential unless you give me permission to publish it.